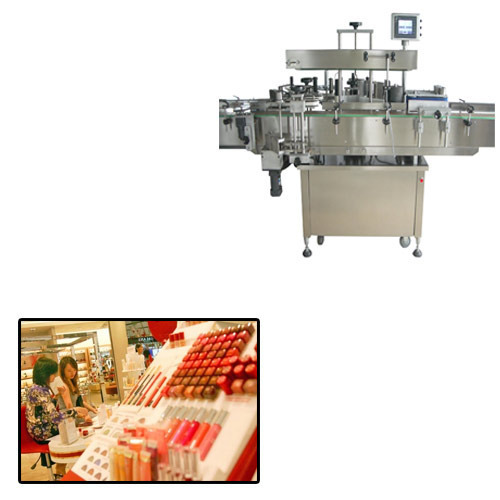 In accordance with customers' differing prerequisites the nation over, we are putting forth an honorable scope of Round Bottle Labeling Machine for Cosmetics Industry. For entirely sticking to worldwide industry rules, we fabricate the gave machine utilizing quality-demonstrated segments and incomparable innovation in adaptation with current business standards. Our offered machine is utilized assorted commercial ventures for marking the jugs. Our in-house quality checking unit empower us to convey deformity free machine at our supporter's end. The round containers positioned & curate spacing between two containers by the belt spacing device and a belt drive mechanism hold the container from top of the container for two sides labeling on flat container at the labeling point, an electronics product sensor sense container & relies a label from self adhesive label roll. If machine is equipped with batch printing device in that case batch printing device prints the batch no. & other matter on label during label is stationary means time between sensing of two label. The sensed round container moves on conveyor sticker label at labeling point wrapped around to container. Then the labeled container moves further through a rubber pressing belt & stationary rubber pad that ensures neat & perfect fixing of label. Conveyor Length of Machines should be 5– 6 feet. Break Assembly to avoid variation during releasing of the sticker rolls. Anti Vibration pad will be provided to avoid vibration during operation of the machine. No Bottle No Sticker mechanism inbuilt. An ISO 9001: 2008, DNB and CE certified Kartikays International was established in the year 2008 and is considered to be one of the leading manufacturer, supplier and exporter of the best quality of Conveyor Systems, Stainless Steel Conveyors, Bucket Elevators, Shrink Wrap Machines, Pouch Packaging Machines etc. The product range offered by us consists of Conveyors System, Pouch Packaging Machines and Air Bubble Bag Making Machines. These machines are fabricated from the best quality of metal and alloys that are sourced from trusted and reliable vendors of the industry. Owing to their user-friendly operation, minimum maintenance, high performance and reduced noise, these food processing machines and equipment are highly appreciated among our customers. State-of-the-art infrastructural base equipped with cutting edge manufacturing equipment, has helped us in manufacturing the offered range of food processing machines in compliance with the industry laid norms and regulations. Wide distribution network ensure that the offered food processing machines and equipment are delivered within the assured time frame at the customers’ end. European, Gulf, African & Middle East countries are places where we export our product range.